Today I had falafel from the Crisp truck for lunch. I've seen it around and read about it somewhere and have been waiting for the opportune moment to strike for some time now. It was on 49th and 6th today, so I cursed my budget, threw my homemade sandwich in the fridge and swore to eat it tomorrow. (I'm coming out about this in public, so please don't give me a hard time Denise.) I ordered the Crisp Mexican falafel sandwich with cilantro pesto, avocado, corn, salsa, nachos and jalapeño dressing. 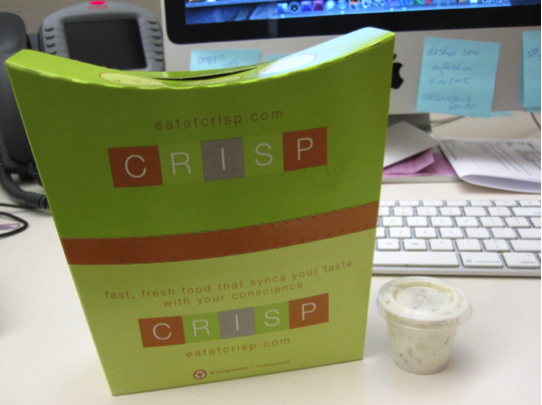 Crisp calls its sandwich dish a falafel handbag, and it comes in a clever little cardboard package that "unzips" around the middle and serves as a holder for the inevitable mess that falafel creates. At first glance the sandwich was a colorful cornucopia of fresh veggies. How appropriate for November. 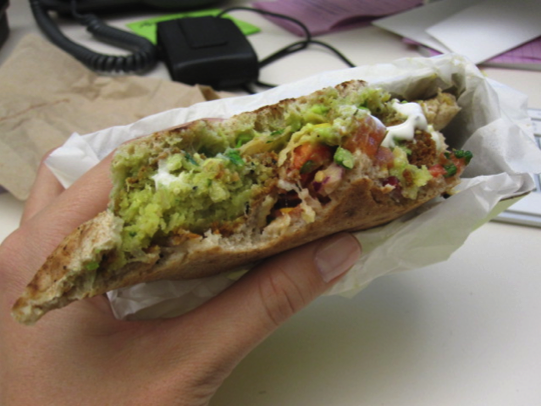 While I cannot say that each of the toppings were evenly distributed (all of the nachos and most of the avocado were at the bottom,) I can say that the falafel was moist and light and the whole sandwich was delicious. The cilantro and jalapeno provided a nice kick and I cooled it down with yogurt sauce. The pita was soft and fluffy there was a choice of whole wheat or white. 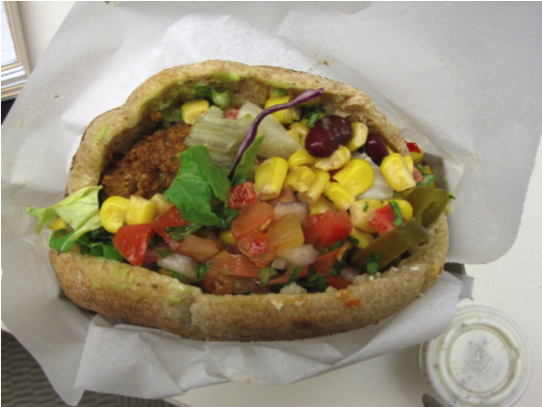 As shown here, there were various toppings throughout the entire sandwhich, so I did not face a full-on falafel situation towards the bottom of the pita. The service at Crisp was quick even though there was a crowd of about 15 people waiting for their orders when we arrived. A manager seemed to be expediting and taking orders and money from the front of the truck and the inside line looked clean and efficient. Cleanliness is always welcome but never a given when ordering food on the side of the street. I would definitely have Crisp again, but next time I would try something different! They have six creative sandwich options including African, Mexican and Parisian, and a few different hummus salad options as well, all at around $10. Any falafel sandwich can be served as a salad. They also have fries that looked delish and can be added to any meal with a drink for $1. I only regret that there is no option to choose your own toppings like at Maoz. Crisp: Follow @CRISPonWheels on Twitter for daily locations, or visit the brick and mortar on 40th between Broadway and 6th. um that looks unreal. do they ship to spain?